Magdalena Urbanová – an artist, the author of the book Enamel in fine arts and the curator of the exhibition Alchemy of enamel – invited enamelers from the whole world to take part in this exhibition as she would like to show the variety of this technique. 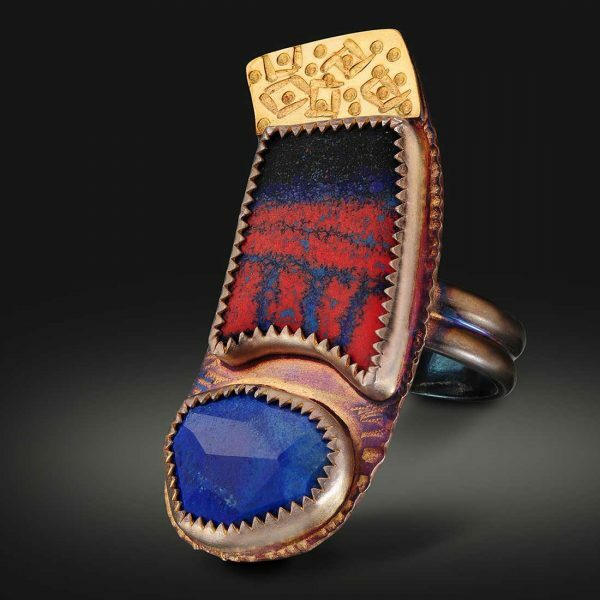 Some of the exhibiting artists make replicas of historical jewelry or use them as inspiration. The others approach the enamel like painters and use its colorfulness and effects. Most of the exhibiting artists will present their work in the Czech Republic for the very first time. Creates enamel jewelry and objects. She finds inspiration mainly in the nature. Marie-Hélène also co-operates with architects and interior designers. Coming from New York’s fashion world as a bridal headpiece designer, Trish has learned to think outside the box. When it comes to making jewelry her creativity follows a different path and is most often influenced by “People, Places and the Art of Other Cultures”. Radka studied “toy design” and dedicated herself to creating toys and puppet for a long time. The last 30 years she has been working with enamel and has transformed the motives of her fabulous creatures and animals using this technique. Since his youth Rudolf has been interested in different crafts. Nevertheless he found the biggest interest in jewelry making and the art of enamel. He looks for inspiration in the works of old masters and the traditional techniques. Julie has been making jewelry for 46 years, primarily one of a kind pieces. Enamel has given her the palette to explore color in more ways then she could with just stones. Julie comes from a painter background, so her enamel art is her alchemy paintings. The curator of the exhibition “Alchemy of Enamel”, Magda Urbanová, is also a co-author of the exhibition “The Art of Enameling / The Enameling Technique”, which is presented in the Technical Museum in Brno until June 3, 2018.